Like John Kapland before us, it seems that the best place to start any investigation into the matter is by going over old (Tampa area) newspaper accounts and see what they had to say about the Licata case at the time. But here the reader should be warned that much of what went to print; ---Even when quoting first hand sources, might be misleading and in some cases out and out false. This was due to a variety of reasons, almost all having to do with the need to sell newspapers. Please keep in mind that in 1933, there was no Internet, no television, no cable, and radio was in its infancy. And while motion picture houses did show international news reels, the only way to obtain the local news was via newspapers. Which in turn made them very profitable institutions, which in turn attracted a lot of competition. Simply put, city of any major size had at least half a dozen local newspapers [5A] and ALL of them were trying to attract readers. Thus the idea was to scoop the competition and get out with the latest story as soon as possible. The gorier the tale, the more shocking the news, the more it sold. --- One can only imagine how the reporters must have gone ape over the Licata story. However, while the Licata incident must have sold newspapers, it also made for bad journalism. In a rush to get to print, there was little time to do fact checking. Little time to obtain actual interviews with those involved, only enough time to contact a buddy in the police department and jot-down the quick reply. Thus the reader should keep in mind that these articles, even if written in good faith, contain numerous technical errors, mis-leading statements and some out and out mis-information. To our knowledge, this article (below) is the first mention of the incident. Note it is from an evening newspaper dated Oct 17, 1933 (the same day that the murders took place). Ruthless blows from a madman's axe last night snuffed out the lives of four members of a Tampa family and probably that of a fifth. The killer was Victor Licata, 21, said to be a mara-juana addict. The dead: Michael Licata, his father. Rosalie Licata, 44, his mother. Prudence Licata, 22, his sister. Jose Licata, 8, his brother. In Tampa Municipal Hospital is Philip Licata, 14, another brother, seriously---perhaps fatally---wounded. The killer, his lips sealed and his eyes wide-staring, is in County Jail where he was removed shortly after noon today. Scenes of the wholesale murder was the Licata home, 1709 Fifth Ave(sic). Time according to estimates of neighbors and medical officers, probably was shortly after last midnight. Called to the Licata home by neighbors whose suspicions were aroused when no signs of activity were observed there during the morning hours, Police Officers Stewart and Bell discovered the crime. They entered the home through a rear window, all outside doors being locked, and stepped into a charnel house. On a bed in the front room they found the bodies of Michael Licata, a welter of blood. He had apparently died with the first blow of the killer's axe. In the adjoining bedroom were the bodies of the daughter, Providence, and the son, Jose. Both had been hacked to death. In the rear bedroom lay the lifeless body of Mrs. Licata. On the bed beside her lay Phillip, breathing. A blood-stained axe lay on the floor nearby. First attention was given the wounded boy and the first ambulance reaching the scene removed him to the hospital where two hours later it was said his condition is critical. He is unconscious and his head severely hacked. Continuing their search the officers discovered Victor cowering in a bathroom. He offered no resistance and was led without protest through the house which a few hours before he had turned into a scene of slaughter. Shortly after discovery of the bodies hundreds of persons congregated at the house. Many were relatives of the family, which had lived in Tampa for more than 40 years. Michael Licata, familiarly known as "Mike the Barber," was part owner of two downtown barber shops and was prosperous. been under the care of a local psychiatrist. That the family feared for their lives was declared by relatives. The father, they said, habitually slept with a pistol between his mattress. Yesterday Mrs. Licata reported it missing. Her Husband searched for it and finally discovered it in the possession of Victor. He relieved him of its possession. Fears that the son would take his own life had frequently been expressed by both Mr. and Mrs. Licata relatives declared. They kept all sharp instruments hidden or under lock and key and poisons were not allowed about the house. Last night, it was said, Victor attempted unsuccessfully to borrow a pistol from a neighbor. A single member of the family escaped death or injury at hands of the insane youth. He is Anthony Licata, a law student at Stetson University, DeLand, and a member of this semester's graduating class. He left for school last week. Officers viewing the scene of the tragedy declared anew their war on the marajuana traffic, which is declared to have attained almost unbelievable proportions here. At County Jail, where the slayer was removed, he remained silent this afternoon. Efforts to arouse him from his apparent stupor were without avail. Bodies of the killer's victims were removed to the J.L. Reed & Son morgue. There they were viewed by officers. Each was apparently killed by blows on or just above the right temple by the blunt edge of the axe. Inspection of the bodies revealed head injuries only. The faces of the mother and father were mangled and apparently had been struck more than once. Only one wound each appeared on the younger sister and the boy. Eyes of all the victims were blackened and swollen. 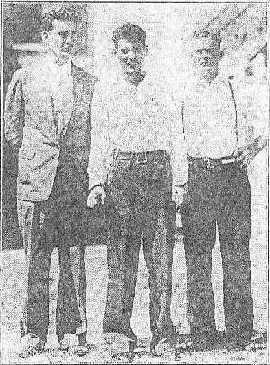 The Licata family is one of the older units of Tampa's Italian colony, with many relatives here. 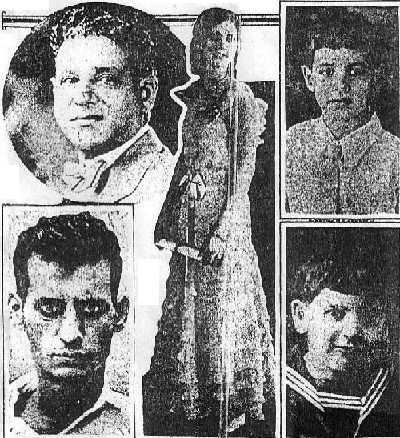 Three brothers, Phillip F., Joseph and victor Licata, and a sister, Mrs. Frances L. Macaluso, survive Mtchael Licata, while Mrs. Licata is survived by her parents, Mr. and Mrs. Antoni Florito, two sisters, Mrs. Sylvester Pizzolato and Mrs. Providence Catalone, of New Orleans and two brothers, Joseph and Anthony Florito. [ * ] indicates facts are either fictitious, contradictory or of a questionable nature. Called in by neighbors, police officers Stewart and Bell were first on the scene and discovered the crime. For more than two years, according to friends and relatives, Victor had been insane and for months he had been under the care of a local psychiatrist. Bodies of the killer's victims were removed to the J.L. Reed & Son morgue. There they were viewed by officers. This next article came out in the Tampa Tribune the next day in a morning newspaper -- Note at the time the Tampa Tribune was not related to the Tampa Times. Victor Licata, 21, in a fit of insanity, killed his father, mother, sister, and two younger brothers early yesterday morning with an ax as they slept in the Licata home, 1707 Fifth avenue, and then locked himself in the home until the crime was discovered about nine hours later. Michael Licata, 47, owner of the Eagle barber shop, 506 Franklin street. All were dead when found except Phillip, and he died last night at 6:30 [PM] o’clock at the Tampa hospital. The slayer, dazed and staring wild-eyed, was arrested at the scene as officers broke into the home. The victims had been struck repeatedly on their heads and faces and lay in blood soaked rooms. The ax also blood-stained, was found on the back porch. Licata was crouched in a chair in the bath room and offered no resistance as officers searched him for weapons. He mumbled incoherently when asked about the crime, and was hustled off to the county jail. Neighbors had heard a commotion in the house yesterday morning about 2 o’clock, and observing later that the house was closed and none of the family moving about they called police and the sheriff’s office shortly before noon. Motorcycle Policeman W.B. Bell, Policeman L.V. Stewart and Deputy Ben Watkins were the first to arrive. They broke into the house through a rear window and found the murder scene. The body of Michael Licata, the father, apparently the first one killed, was found on the floor wedged between a bed and the wall in the front bedroom, indicating he had struggled violently. 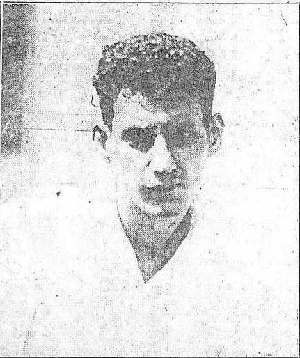 In an adjoining room was the body of Mrs. Licata on a bed with the form of young Joe Licata by her side. Miss Providence Licata was stretched dead on a bed in a back room, with Phillip, unconscious but with a spark of life left on another bed nearby. As the officers dashed into this third room of death they noticed that one of Phillip’s legs moved slightly. He was rushed to the Tampa hospital where he died early last night. The other bodies were removed to the J.L. Reed & Son funeral home. Tom Macaluso, next-door neighbor, said he heard a series of noises in the Licata home about 2 o’clock that he got up and went to both the front and rear doors and yelled in a loud voice if there was any trouble. Everything was still in the house then he said, and getting no answer, he returned to his home and to bed. Other neighbors said they also heard the noises in the Licata home. Convinced after hours of watching that something was wrong. Mrs. Macaluso telephoned the police and sheriff’s men. Joe Licata, café owner and a brother of the slain man, reached the home as the officers arrived. Nick Macaluso, [ ]23 Twelfth avenue, a brother-in-law of Michael Licata, also had been notified and drove to the scene with his wife. The screams of Mrs. Macaluso when the bodies were found stirred the neighborhood into a frenzy of excitement. Relatives of the family said young Licata had been acting strangely for several months and had been under treatment of psychiatrists. The family had lived in fear, relatives said, that he would do himself or others violence. W.D. Bush, city detective chief, said he had made an investigation prior to the crime and learned the slayer had been addicted to smoking marijuana cigarettes for more than six months. This he said, had unbalanced his mind, at least temporarily. A similar statement was made by Frank S. Castor; state drug and narcotic inspector, who said he had aided Bush in the investigation, and was prepared to make charges against the youth when he heard of the ax slayings. He had also learned of several places where Licata brough the doped cigarettes. Apparently Licata returned to his bed and slept after crushing out the lives of his family. When arrested he wore a white shirt and grayish trousers. There were no blood stains on them. The officers failed to learn whether he changed clothes after the crime, but no clothing with blood marks was found. Whether he sought the pistol to end his life or to barricade himself in the home, was a point the officers could not wring from him. He apparently returned to the home from the Monte barber shop, but his departure and return were not observed by neighbors. Motorcycle Officer Bell attempted to question Licata at the time of arrest. He and Deputy Watkins took the slayer to jail. “We found the boy seated in the bathroom with the door closed,” Bell said. “I asked him ‘what’s the matter, Victor?” He only looked at me wildly. Made no effort to answer. At the jail Licata talked to prisoners, however, and told a vague story of how he had “killed five of them.” It was a rambling sort of a story, as repeated by some of the prisoners with whom he was placed in a cell. He was evidently insane or acting the part. But he refused to talk with a reporter. He just didn’t want to talk to anybody, after he is said to have made all sorts of wild statements about himself to the men in the lock-up with him. Somebody told him what he had done-that he had killed his whole family with an ax. He showed no surprise, little interest. One of his cellmates said he seemed to understand for a time what he had done, but for the crime he expressed no regret. One member of the family escaped the murders. He was Anthony Licata, senior law student at Stetson university, who had just returned to the university last week. The family was well known in Italian circles here and had resided in Tampa for 40 years. Michael Licata, the father, was a brother of Philip F. Licata, Italian consul here; Victor Licata, businessman, and Joe Licata, Ybor City restaurant owner. Mrs. Licata was a daughter of Mr. and Mrs. Antonio Florito 2407 Taliaferro street. Preparations for the funerals had not been completed last night, but relatives said all five of the victims probably would be buried at the same time. A tentative charge of murder was placed against the accused son as officers prepared to hold an inquest and a sanity hearing. Relatives of the family said young Licata had been acting strangely for several months and had been under treatment of psychiatrists. When arrested he wore a white shirt and grayish trousers. There were no blood stains on them. The officers failed to learn whether he changed clothes after the crime, but no clothing with blood marks was found. “Crowd began to jam into the house, threatening violence, we rushed him out the back way and into a car. Victor Licata, businessman, and Joe Licata, Ybor City restaurant owner. Between 8 and 9 o’clock yesterday morning Licata left the home -- He went to the Monte barber shop, 1709 Seventh avenue, and asked to borrow a pistol, which was refused. The proprietor said the youth offered no explanation. Similar statement was made by Frank S. Castor; state drug and narcotic inspector, who said he had aided Bush in the investigation, and was prepared to make charges against the youth when he heard of the ax slayings. He had also learned of several places where Licata brough the doped cigarettes. Tom Macaluso, next-door neighbor, heard a series of noises in the Licata home about 2 o’clock that he got up and went to both the front and rear doors and yelled in a loud voice if there was any trouble. Later that the house was closed and none of the family moving about they called police and the sheriff’s office shortly before noon. Joe Licata, café owner and a brother of the slain man, reached the home as the officers arrived. The victims had been struck repeatedly on their heads and faces and lay in blood soaked rooms. Joint funeral services for the five victims of a madman’s brutal axe will be held tomorrow afternoon at 4 o’clock at the chapel of J. L. Reed & Son, Florida and Palm Aves. Simple rites will be conducted by Rev. Anthony Besovzzi S. J., pastor of the Most Holy Name Roman Catholic Church, of which all were members. Burial will be in L’Unione Itallana Cemetery. Rites will be held for Michael and Rosalia Licata, parents of the family; Providence, 22-year-old daughter; Philip 14, and Joseph 8, killed by Victor Licata, 21 who is now in county Jail. Pallbearers for Providence will be Alfred Reina, Peter Pupallo, Peter Matlina, Sam Puppello, John Z. Ferlita Jr. and Ernest reina; for Philip will be Santa Trafficante, Joe F. Cacciatore, Frank Ferreri and Mike La Barbera; for Joseph John Minardi, Frank Massari and Ernest Maas Jr. and Sante Fierita. Pallbearers for Mr. And Mrs. Licata will be named later. Hundreds of relatives and friends of the Licata family are visiting the funeral parlors of J. L. Reed & Son where the bodies are lying. J. Rex Farrior, State attorney, today said no inquest will be held. An inquest or other preliminary investigation, Farrior said, is unnecessary. Farrior has not determined what (Continued on Page 4) steps he will take to have young Licata answer for his crime. If the killer is a victim of chronic or recurrent insanity, it was pointed out today, he is not responsible, from a legal standpoint, for the murders. But if he committed the murders in a fit of temporary insanity brought on by indulgence in narcotics or marijuana cigarettes, he is just as responsible for the crime as a man who kills while under the influence of liquor, it was pointed out. Farrior is conducting a close study of young Licata’s past life, actions and activities. His findings, he said, will determine the course he will take. J. Rex Farrior, State attorney, today said no inquest will be held. An inquest or other preliminary investigation, Farrior said, is unnecessary. If the killer is a victim of chronic or recurrent insanity, he is not responsible, from a legal standpoint, for the murders. But if he committed the murders in a fit of temporary insanity brought on by indulgence in narcotics or marijuana cigarettes, he is just as responsible for the crime as a man who kills while under the influence of liquor. In this article, the reader should note the rush to demonize the Medical Marihuana. Also note the date of this article, --- just one day after the murders. It almost seems like it was all planned. Every agency of the police department, with assistance pledged by federal, state and county law enforcement officials, will be put to work at once to stamp out the use of marijuana weeds as a narcotic, Police Chief Logan said yesterday after he had been informed that the weed used as a cigarette, had been indirectly to blame for the wholesale murder of the Michael Licata family. Logan said he has been informed the sale of marijuana cigarettes had reached alarming proportions here and was causing much concern to relatives and friends of addicts. The weed, brought here from Mexico and transplanted, grows quickly. It is dried and cured and rolled into cigarettes which retail at from 20 to 30 cents each. Early in august, after three weeks of secret investigating, police and agents of the state board of health made a general round-up of suspects, arresting 22 and filing direct informations against five in the state courts under the recently enacted state narcotic law. “If necessary I will use my vice squad, the auto theft bureau investigators and detectives to completely wipe out the weed.” Logan said, “The country solicitor, state, county and federal officials have promised me help and cooperation. With this kind of help it will only be a question of weeks until we have the situation under control. Victor Licata had a dream a horrible nightmare that snapped the last bit of sensibility out of his dope-tortured brain and made him a butcher. He dreamed his father—Big Mike the Barber—held him tight against the wall of their home in Ybor City, and laughed and sneered at his futile struggles to get free. He dreamed his mother---Resalia---hurried in from the Kitchen with a huge carving knife in her hand, and jeered and taunted and mocked him as he fought against his father’s iron grip. In his dream Mike and Rosalia severed his arms at the elbows. They made him a pair of wooden arms, with iron claws at the ends, and strapped them to his stumps. Beautiful Providence, his 22-year-old sister, strapping young Philip, 14, and little Joe, baby of his family, stood in the room and laughed. It was a dream, of course, the kind of a nightmare that lifts its ugly head out of a deadly combination of raw moonshine and dope, but it was a dream that brought a sudden and horrible death to five happy members of the Licata family. In County jail, where Victor Licata was hurried at noon yesterday immediately after police found him cowering in his home at 1709 Fifth Ave., surrounded by the bloody bodies of his victims, the young “dream slayer” talks freely. From his babbling, auditors have been able to piece together a jumbled pictures of what happened in the Licata home sometime between midnight and daylight yesterday. There is little doubt in the mind’s of officers that Victor is insane. But whether he is as crazy as he attempts to show is declared questionable. To his comrades in his cell block, third floor left Victor talks calmly and rationally—as long as they are alone, But the moment a stranger or interviewer appears in the corridor, he becomes a raving maniac, his lower jaw hanging limply his pin-pointed eyes staring and his words incoherent. He crawls on the floor, claws and paws at his companion, and shakes the bars. Even now with the effects of his marijuana jag worn off, Victor does not realize, or will not admit, that he killed his family. One moment he talks freely of a killing of some kind, the next he is silent. When first admitted to the cell block after his arrest yesterday morning, he appeared a raving maniac, but other men in the cell block—John Lewis Flynn, Arthur Guest, Robert Knowles and Cecil Long---took that out of him. Introduced to “jail discipline.” Victor calmed himself and told his story. He repeated it to reporters last night. Victor paused to shake at the bars. “I never killed anybody. I hit them with an axe, and knocked off every _____ _____ that was in there. My uncle, and some old woman. Then two other men and two other women. Six there were, not five! He swung his arms in a slashing, crushing way. “I knocked them all off but I didn’t kill them. “Why didn’t they let me out of here. I go to the door and they shove me back. I shake on the gates and they won’t move. I’m the strongest man in the world, but the gates won’t move. Victor, by his own story, returned to his father’s home some time between 8 and 10 o’clock Monday night. His father was at his barber shop. His mother was working in the kitchen. Providence, his sister, was out. Fourteen-year-old Phillip and eight-year-old Jose were in bed. Victor himself, if he followed his customary habits was “charged to the skies” on marijuana, sodden in moonshine liquor. For hours before he went home he rode on somebody’s truck---a liquor truck, he said---but he refused to name his companions. “I just went to bed and went to sleep,” he continued. “My father held me on the wall, and my mother helped him cut my arms off. They put wooden arms on, but look!” – Victor shoved his arms through the bars --- “my arms are (continue on page 4) all right now. I was scared. My arms were gone. I had a pain in my stomach. I went to the kitchen and got a drink of water and took the bottle with me, somewhere. His statement, however, will not be needed in the event the court sets aside the insanity plea it is expected he will make and puts him on trial for his life. On the handle of the axe used in the slaying are his fingerprints. His underwear, which police found still on his body beneath a clean white shirt and well-pressed trousers, was sodden with blood --- the blood of his father, Mike, his mother, Rosalia, sister Providence, and his brother, Philip and Joe. Victor, by his own story, returned to his father’s home some time between 8 and 10 o’clock Monday night. His father was at his barber shop. His mother was working in the kitchen. Providence, his sister, was out. Fourteen-year-old Phillip and eight-year-old Jose were in bed. Victor himself, if he followed his customary habits was “charged to the skies” on marijuana, sodden in moonshine liquor. For hours before he went home he rode on somebody’s truck---a liquor truck, he said---but he refused to name his companions. I had a pain in my stomach. Shadows and figures stealing through an alleyway. Knuckles rap softly, furtively against a door panel, beating a cryptic tattoo. A peephole opens, brief inspection, and admission. Within a sparsely furnished room, groups and individuals seated. All waiting "the man." Soon he comes silently, with catlike tread, his wares hidden within a small tine box concealed in a pocket. Eager hands reach for the cigarrettes---paper wrapped tubes, harmless appearing. "The man" disappears as quickly and as quietly as he entered. Singly and in small groups his customers depart. Smoke that inflames the brain. Vapor that turns the blood to seething, boiling lava. Witness yesterday. A family slain. A loved son behind bars, his finger-prints on the murder ax. Recently the State opened a campaign against sale of the weed. Arrests were made here in Tampa and else-where in the State. One convicted seller has been sentenced to a year in prison. And still, officers and underworld tipsters declare, marijuana is sold---is purchased----is smoked in Tampa. Hundreds, those who are in position to know declare are addicted to its use. Hundreds of persons---many of them young---many of them girls---have inflamed their brains with marajuana. Hundreds of others, unless the sale is curbed and stopped, will join the ranks. Every, law enforcement agency in Hillsborough County was ready today to open a fight to the finish against the sale of marajuana, the narcotic which indirectly caused the murder of a family of five Tampans. Promised the help of State and County officials in a drive against the dope. Police Chief Logan issued orders to his men to stamp out the traffic in Tampa, and to stay on the job until the last particle of the murderous weed has been driven out of the city. Recently officers, armed with information assembled during several weeks of investigation, staged raids throughout the city and arrested 22 men suspected of using or selling the weed. Five of them were charged in Criminal Court under the State law adopted by the 1933 Legislature. But the use of marajuana, despite the raids continued to progress until, today, it constitutes a deadly menace to the city, officials declare. Victor Licata, who early yesterday slaughtered his mother and father, a sister and two brothers, is known to have been a marajuana addict, officers declare. It is among young people, investigators declare, where marajuana has made its greatest inroads. The recent investigation revealed appalling information concerning the use of the cigarettes among ‘teen-age boys and girls, and numerous cases have been reported of youths whose minds are on the verge of cracking because of their frequent visits to the “muggles” joints, where marajuana addicts gather to smoke the weed. Originally a Mexican narcotic, marajuana was imported into the United States through the southwestern states. It spread into the larger cities of the North and within recent years, has been brought into the South. Because of its comparative cheapness—a cigarette retails from 30 cents to 50 cents---it has become a popular “thrill” producer among youths. It may or may not be wholly true that the pernicious marijuana cigarette is responsible for the murderous mania of a Tampa young man in exterminating all the members of his family within his reach---but whether or not the poisonous, mind-wrecking weed is mainly accountable for the tragedy, its sale should not be and should never have been permitted here or elsewhere. That the plant from which these cigarettes are made is actually grown in and about Tampa is positively known, and that the cigarettes are manufactured, sold and smoked here has been common knowledge for some time. The habit appears to have first developed in the Harlem district of new York City, whence it was imparted to other cities. It required five murders to impress the Tampa public and Tampa officials with the serious effects of the habit. Because the production and merchandising of the deadly drug are limited here to comparatively few, it should not be a difficult task to stamp it out completely. To do this it is requisite that the courts cooperate with the officers and that legal technicalities and tricks be barred. Victor Licata, 21-year-old ax slayer of five members of his family, was reported by a lunacy commission yesterday to be criminally insane. His condition is acute and chronic, the report said. It was filed with County Judge Cornellus, who said he would confer with J. Rex Farrior, state attorney, before formally adjudging Licata insane. The commission was composed of Dr. W. J. Lancaster, Dr. G.C. Bositari and Ed Vestel, county jailer. All appointed by the county judge Thursday upon a petition signed by Philip F. Licata, an uncle of the slayer, and four others. Farrior said after the report was made he had not decided whether the case would be placed before the new grand jury. The jury will be empanelled Nov. 7 upon convening of the fall term of circuit court. Prisoner Without Funds Farrior insisted however, that if Licata is removed to the state hospital at Chattahoochee upon the commission report the state would not pay expenses of this transportation. The report said the prisoner is insolvent. In describing Licata's form of insanity, the report said he is subject to hallucinations accompanied by homicidal impulses and occasional periods of excitement. The commission also found his physical condition poor. Licata was arrested Oct. 17 at his home, 1707 Fifth avenue, nine hours after he killed his parents sister and two younger brothers with an ax as they slept. Victor Licata, 21, slayer of five members of his family here on Oct. 17, will not go on trial for first degree murder. Formally declared Insane by County Judge Cornellus, who acted upon the report of a lunacy commission, he has been ordered transferred to the State Hospital for the Insane at Chattahoochee. Licata must stay at the State Hospital for the rest of his life, and although he may later recover his sanity, he cannot be released except on an order issued by the County Judge. He will be turned over to Dr. H. Mason Smith, psychiatrist and former superintendent at the State Hospital, to be transferred to Chattahoochee. J. Rex Farrior, State attorney, said he will not ask the Grand Jury, which meets here next Tuesday, to indict Licata for murder. It would be a waste of money, he said, to attempt to try him for murder when it already has been clearly and definitely established he is insane and has been for more than a year. Licata's transportation to the hospital and his care there must be paid for out of his own estate. He and his brother, Antonio, only other surviving member of the family, will share equally in the estate left by their parents. The youth killed his father and mother, Michael and Rosalla Licata, his sister, Providence, and two brothers, Joe and Philip. Licata's transportation to the hospital and his care there must be paid for out of his own estate. He and his brother, Anthony, will share equally. The following is the AP (Associated Press) version of the story, which was widely reprinted around the country. Tampa, Oct. 18.---(AP) --- Denial he killed his parents, two brothers and a sister was made today by Victor Licata, 21, but he told at the same time, deputies sheriff said, of a "dream" in which he hit" six persons with an axe. Licata, found crunched in the bathroom of the locked home in which police discovered the bodies of four of the Licata family and another dying yesterday, was once named in a lunacy petition that later was withdrawn when his family maintained they could care for him. Charged with murder when his 14-year-old brother Phillip died last night, Licata maintained a stolid silence. Today, however, he talked with the deputies and told of his dream. In this dream, he said, he was being tortured by members of his family, "had a pain in my stomach," and later saw "real blood dripping from an axe." The parents, Mr. and Mrs. Michael Licata; their daughter, Providence, and the two sons, Phillip and Josepth, were slain with an axe. No preliminary hearing date has been scheduled for Licata. Funeral services for the five victims will be held tomorrow in the Italian cemetery. The following is a composite summation (real or imaginary) of ALL the relevant facts as per the local Tampa Florida newspapers. WARNING some of these facts are in error [and we mean, way in error]. [ * ] indicates facts are either fictitious, contradictory or of a questionable nature. Crowd began to jam into the house, threatening violence, we rushed him out the back way and into a car. When arrested he wore a white shirt and grayish trousers. There were no bloodstains on them. The officers failed to learn whether he changed clothes after the crime, but no clothing with blood marks were found. Victor that night was charged to the skies on marijuana and sodden in moonshine. For hours before he went home he rode on somebody’s truck (a moonshine run). Neighbors told of the family's loyalty to the mentally deficient son. For more than two years, according to friends and relatives, Victor had been insane. For months he had been under the care of a local psychiatrist. Petition of Philip F. Licata Victor was turned over (under the control of) Dr. H. Mason smith, psychiatrist. Michael Licata, his father - Part owner of two downtown barbershops and was prosperous. All killed by blows on or just above the right temple by the blunt edge of the axe. Bodies showed head injuries only. If the killer is a victim of chronic or recurrent insanity, he is not responsible, from a legal standpoint, for the murders. But if he committed the murders in a fit of temporary insanity brought on by indulgence in narcotics or marijuana cigarettes, he is just as responsible for the crime as a man who kills while under the influence of liquor. J. Rex Farrior, State attorney, said he will not ask the Grand Jury, to indict Licata for murder. It would be a waste of money, he said, to attempt to try him for murder when it already has been clearly and definitely established he is insane and has been for more than a year. Fears that the son would take his own life had frequently been expressed by both Mr. and Mrs. Licata relatives declared. They kept all sharp instruments hidden or under lock and key and poisons were not allowed about the house. Police entered the house (morning hours) through a window – all outside doors being locked. Victor had a bad dream, Victor had a horrible nightmare – that his family was torturing him. His father was at his barber shop. His mother was working in the kitchen. Providence, his sister, was out. Fourteen-year-old Phillip and eight-year-old Jose were in bed. -- I had a pain in my stomach. Obviously, the above quoted newspaper articles are but a small fraction of what has been written about Victor Licata and his legend. They were presented here solely because they constitute one of the few sources of “first hand” accounts available to use today. BUT WARNING – as previously stated, NUMEROUS ERRORS and even some out and out falsehoods seemed to have made their way into the story accounts. Some of the readers may have already made note of some of them. And why shouldn’t errors have made their way into these accounts. After all the reporters were (obviously) in a rush to make their schedule deadlines etc. However, as references (In future chapters) will be made to them, It is hoped that the reader has as least skimmed through some of them. At that time (1933), The Tampa Times, an evening newspaper, and the Tampa Tribune, a morning newspaper, were published by separate companies. Ever since June 1, 1958, both newspapers have been owned and published by the Tribune Company.